Stomphia coccinea (Muller, 1776) is widely distributes in northern seas and North Pacific. 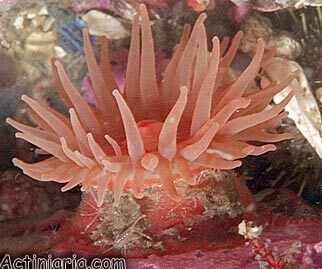 Stomphia coccinea is a medium sized species, shallow-water specimens in North Pacific being no more than 3 cm high (although larger specimens occur in greater depths); conical body has wide pedal disk, up to 5-6 cm diameter, oral disk typically 3 cm diameter or less. Conical tentacles, about 70 in number, may be a little longer than the radius of oral disk. Body wall is smooth, usually beige or reddish, sometimes with irregular darker spots or lines. Oral disk is of the same color, but usually paler. 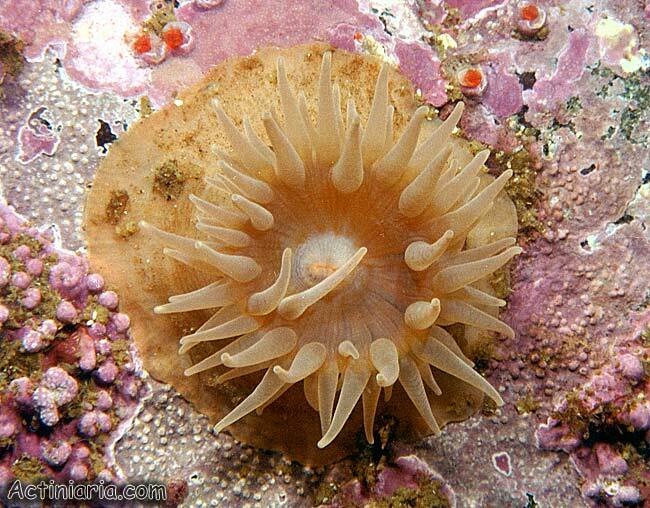 Small white spots are often present at the bases of the tentacles and radial red lines outline the tentacle bases (photo below). The species always lives on open surfaces of stones and rocks, never buried in sand. It typically occurs on the depths more than 10 meters. 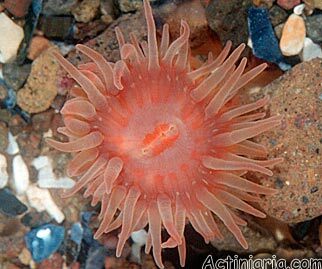 Body shape of Stomphia coccinea resembles young specimens of another North Pacific species Cnidopus japonicus; on the photos young specimens of the latter species can be distinguished by white thin radial lines on the oral disk (but white lines disappear in older specimens).